As you’ve probably gathered by now, I’m currently mid-series of an embroidered exploration of my eating disorder. 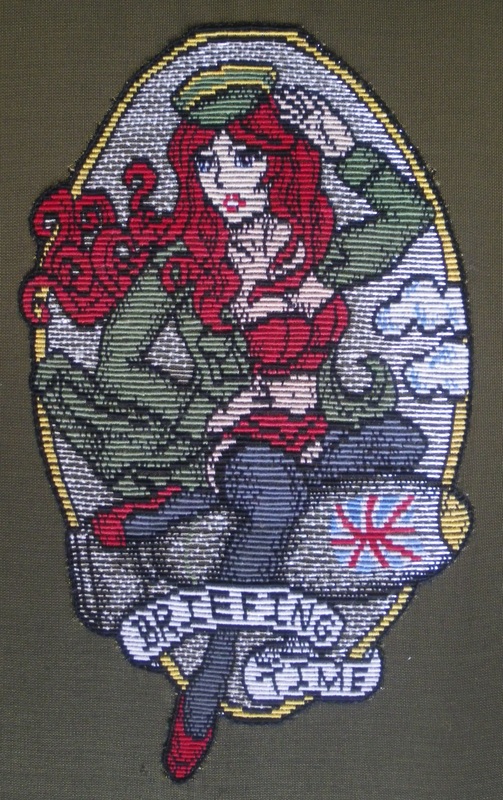 Firstly, thankyou to the lovely articles from Makezine and Mr X Stitch highlighting the first 3 in the series. But wait, there’s more to be served up yet…. ‘Mars’ bar – Perhaps this pun is a litle tenuous, but it’s one I definitely wanted to include. During my struggle with my rocky relationship with food, the seemingly humble Mars Bar was my nemesis. It’s just too gooey and chocolatey indulgent to easily resist. Perhaps appropriately, it’s also the one chocolate bar blaring its’ name from a red and black background, symbolic of something dark and dangerous. Back to the technical perspective, and I think this piece has to be my best-executed yet. The letters possess a little more height that the others, something enhanced by further felt padding over the red section. The gold couching then required extra care, ‘building up’ almost vertically instead of lying on the easier flat surface. 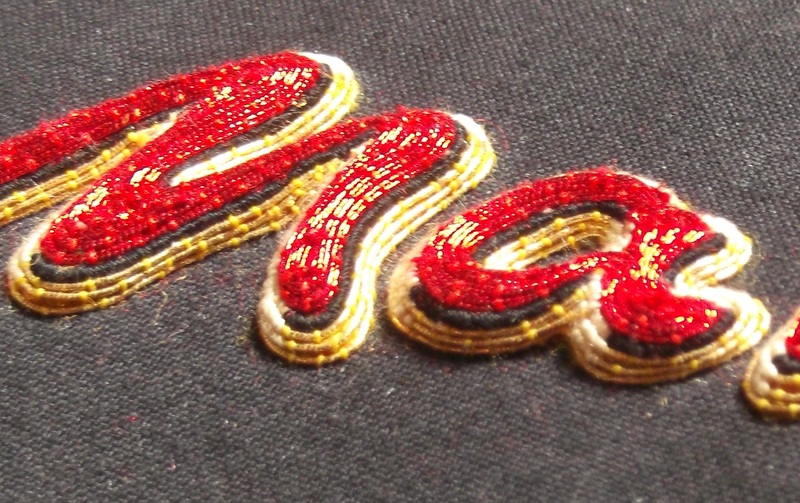 Cream highlights and black shadows were worked using the goldwork technique of ‘or nue’: very dense couching stitches providing a solid block of colour over the golden core thread. And all without showing the slightest scrap of felt padding: a smooth transition from background fabric to embroidered areas. 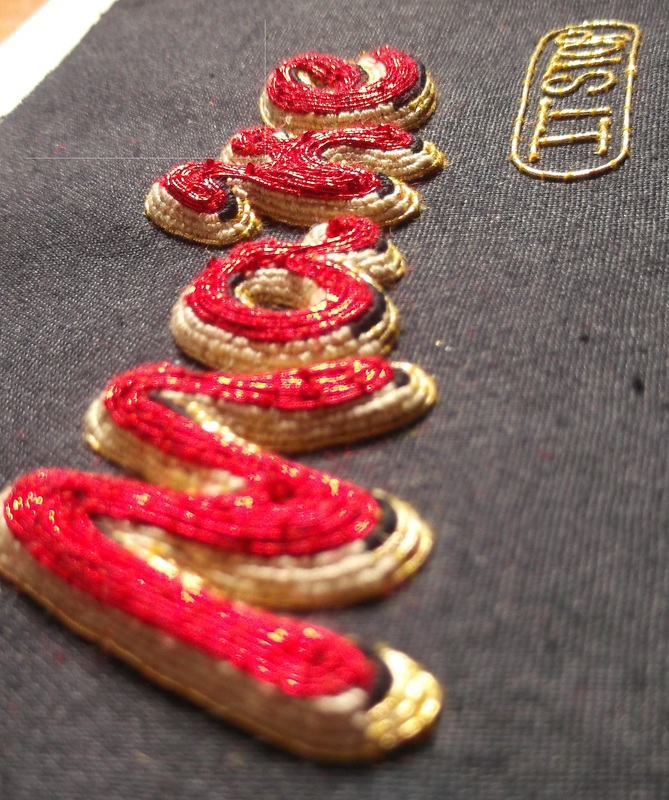 When I was working on goldwork pieces for London-based ‘Hand and Lock’, their method of producing a similar style of raised-up goldwork was slightly different – Sections of the embroidery would be worked separately, on a flat background, and then appliqued on in stages. So the golden couching, with its densely worked highlights, would be worked separately onto a flat fabric and then stretched / stitched over the prepared padding. Similarly, the red letters would probably have been worked separately, and again applied afterwards. This method has two main advantages: Not only do you no longer have to stitch all that dense black couching through multiple layers of padding (a trial for the fingers at times! 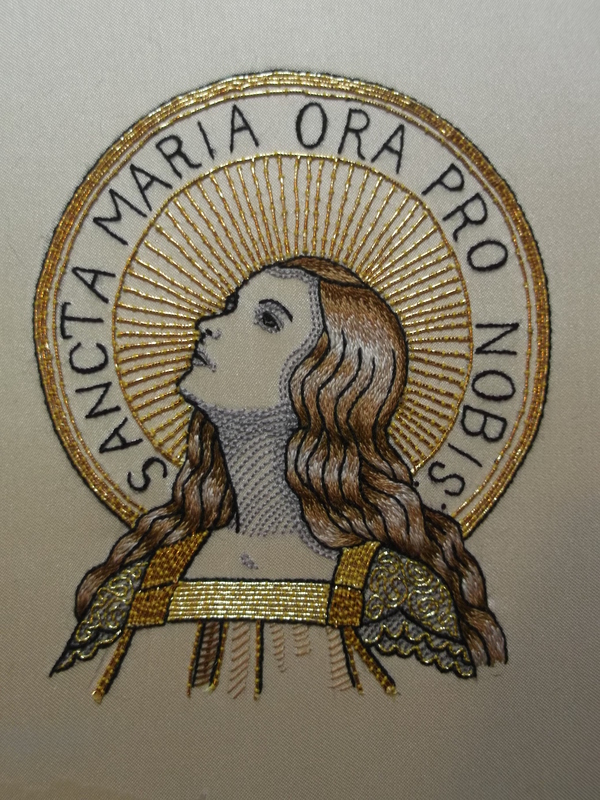 ), and multiple embroiderers can work on separate pieces, speeding up the overall process. However – personally, I find this approach highly flawed. Appliqued pieces seldom fit exactly perfectly, despite precise planning, and will require an additional line or two of couching to hide a slipstitched join. It would be almost impossible to achieve such a neat finish as I have produced here. It really is best to produce the entire piece as one unit, building each section directly onto the intended background fabric as you go, and just make sure you’ve got a good thimble to hand…..
Thankyou! As far as ‘too few hours in the day’ go, I couldn’t agree with you more….